Yagna is an ancient purification ritual that can be practiced by anyone in order to connect with a higher consciousness or with a cosmic force. It uses fire as its medium, to allow for the performer of the ritual to reach a place of clarity. Fire is an important tool for this practice as it relates directly to a way to cleanse the environment and signifies power to the user. Yagna began as a ritual sacrifice to the sacred “Agni,” the cosmic fire of the universe. Agni was also the first word in the book of Rigveda, the oldest book of Sanskrit hymns. 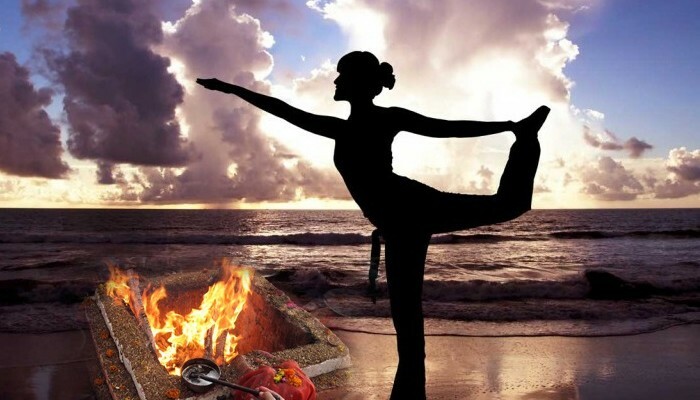 This ritual allowed the Yogi to be in direct contact with the source of the universe through a connection with the elements. An altar of bricks was made, followed by some added kindling, some ghee (clarified butter), and is all ignited from a piece of flint. Sacred verses were chanted from the Vedas, knowledge texts, and sacrifice was then made to the fire. The length of this ritual could last many days and was conducted to help the well-being of all. To perform a Yagna also had a significant impact on your Karma, as the performer was doing an act of sacrifice, which was a good action for his or her karma. Before you build an altar and light it with fire, first you need to set your intention of sacrifice. You will need to decide what you need to release in order to gain clarity and connect with the universe. You will select a mantra or an affirmation to repeat throughout the ritual that relates directly to your intention. You will want to make sure you have enough time as this ritual can take a while to complete. Set up a clay pot to hold fire, and place a long cotton wick within. Using clarified butter is the purest form of fuel for your fire, and it also connects directly back to ancient traditions. When you are ready to begin, find a peaceful and safe spot and close your eyes and reaffirm your intention. Light the fire and gaze into it as you repeat your mantra. Some sacred amounts of time to repeat the mantra can be 11, 21, 108, or 1008 times. Each time you say your mantra, add in a matchstick or a piece of camphor (a crystalline substance with an aromatic smell) into the flame. When you have completed the ritual, reaffirm your intention and allow for the fire to distinguish on its own accord. Yagna is a great ritual to perform when you are feeling a need for change, a time to move on, or you want some insight. Staring into a fire as you perform your affirmations can cause you to move into a meditative state, so beginners are suggested to start with a small flame until they better understand the power this ritual can have. This fire is connected directly with our inner fire within; if we neglect it, we can lose focus and become lost. By conducting this ritual, we will reignite our own fire and find the clarity we seek. Previous story The Crane Pose vs. The Crow Asana – What is the Difference?